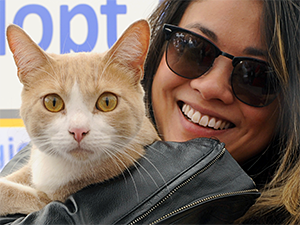 Now you can dedicate any special occasion to NYC's homeless pets or community cats! Make the most of your big day by setting up an online fundraising page for the Mayor's Alliance for NYC's Animals in honor of the special events, people, and pets in your life. …or honor or memorialize a family member or friend — human or pet! Go to our GiveCorps page. Choose the life-saving program you would like to support with your fundraiser, or choose "Mayor's Alliance for NYC's Animals" if you would like donations to go to our area of greatest need. Follow the instructions to create your page. Share your passion for the littlest New Yorkers by sharing your custom fundraiser link with all of your family and friends! If you have questions about getting started or would like tips on the best way to set up your fundraiser, please e-mail GivingTeam@AnimalAllianceNYC.org. The Mayor's Alliance for NYC's Animals is recognized by the IRS as a 501(c)(3) non-profit organization (EIN: 73-1653635). All donations are tax-deductible to the fullest extent allowed by law. A copy of the Mayor's Alliance for NYC's Animals' latest annual report may be obtained, upon request, from the Mayor's Alliance for NYC's Animals or from the New York State Attorney General's Charities Bureau, Attn: FOIL Officer, 120 Broadway, New York, NY 10271.